Download a blank fillable Enrollment / Exclusion Form in PDF format just by clicking the "DOWNLOAD PDF" button. Complete Enrollment / Exclusion Form with your personal data - all interactive fields are highlighted in places where you should type, access drop-down lists or select multiple-choice options. Follow instructions on the back of this form. Print or type all information. 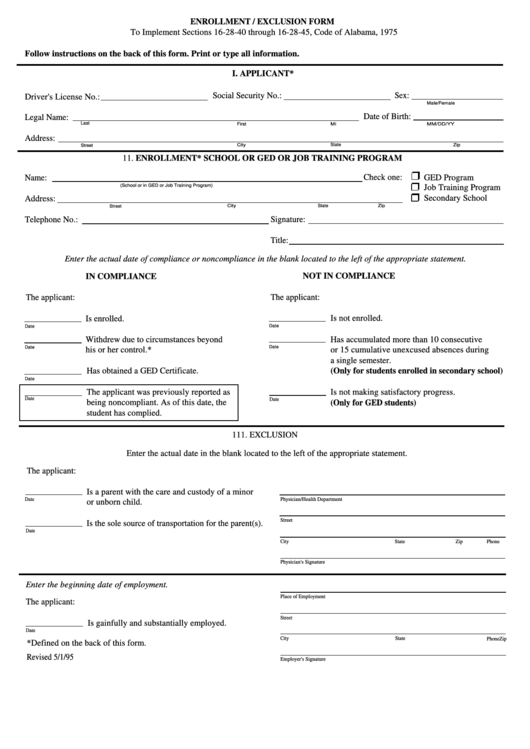 Enter the actual date of compliance or noncompliance in the blank located to the left of the appropriate statement. Has obtained a GED Certificate. Is not making satisfactory progress. Enter the actual date in the blank located to the left of the appropriate statement. Is the sole source of transportation for the parent(s). Enter the beginning date of employment. Is gainfully and substantially employed. *Defined on the back of this form.